I used to avoid “never-ending” games in the past because they kept me from finishing games, but that all changed when Fortnite and then Paladins were released on the Nintendo Switch this year. I don’t play Fortnite as much as I did in the first few months that it came out, but right now I am having a hard time keeping myself away from Paladins. Literally every time I pick up the Switch, it’s either I’m going to play Paladins or am going into a co-op gameplay session with my fiancee. So why am I suddenly hooked on a type of game that I used to avoid? Why has Paladins kept me engaged until now, something that Fortnite wasn’t able to do despite it being more popular? Let’s take a look. 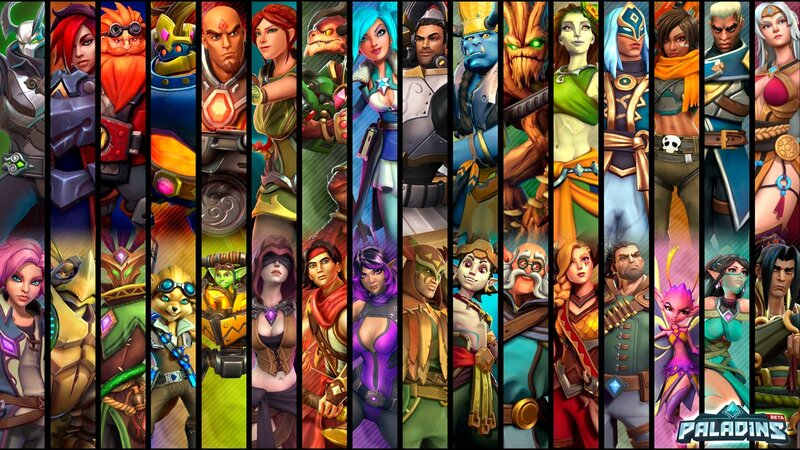 Paladins has so many characters (called Champions) to choose from. (Art by andersonlsjr of DeviantArt). I’ve played a lot of shooters in the past (Quake II and III, Half-Life, Unreal, and of course Counter-Strike) and what eventually turned me off of the genre is how repetitive the experience can get. I think that has changed recently but I haven’t had a decent gaming PC in years, and I haven’t had anything but Nintendo consoles for quite some time now so I can’t really say for sure. What I can talk about is my initial Paladins experience. The first big difference that I felt was in Paladins, you didn’t play as generic nameless soldiers – you had to choose from named characters (referred to as Champions in the game) that each had different skills and abilities. 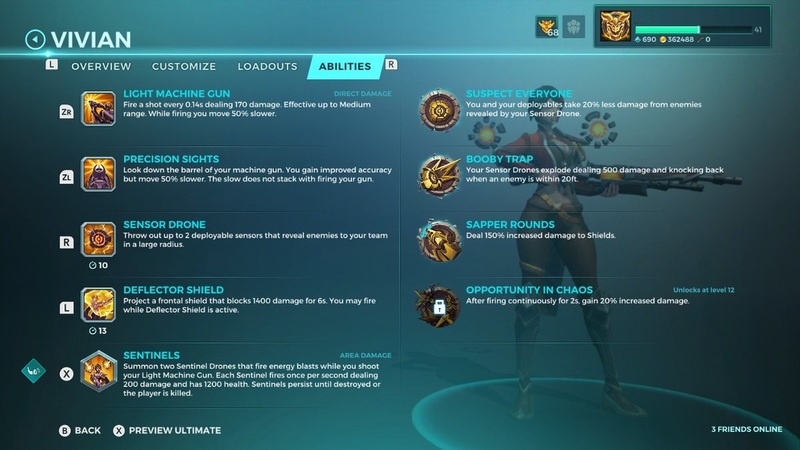 There are four general types (classes) of characters in Paladins: the Damage Champions (your main damage dealers), the Flanks (quick-moving Champions that usually target opponents with low health), the Frontlines (your tanks, Champions with high health and defensive capabilities), and the Support Champions (usually with healing capabilities). When you first start Paladins, you have five Champions available for free while an additional four Champions (cycled regularly) are available for free use temporarily. I read up on Paladins and had a general idea of how each Champion class is supposed to play, but this is where I first saw how unique each Champion is – the two Damage Champions available for free at the onset are quite different from each other. Viktor is a little more closer to what you find in games like Counter-Strike and Call of Duty with his automatic rifle, grenades and run ability. Cassie (one of the best Champions in the game, and you get her for free right away!) meanwhile uses a crossbow, relies on accuracy and a smart use of her different attacks to get your kills. When playing Paladins, I not only cycle through the different Champion classes, I also cycle through different Champions in each of those four classes (I now have a total of 14 Champions across all classes). I do have my mains and secondaries but I make sure that I give all the Champions that I can play a run every now and then. I get a different kind of fulfillment when I’m part of a team and we’re able to win – it feels like I contributed to the success of others, and that feels so good. You get the same team-based experience in a lot of these shooters but in Paladins, having defined roles helps me identify how exactly I should contribute to my team and it also helps define what the team should expect from me. Let me emphasize the second point – it’s very different from my old Counter-Strike days wherein everyone expects you to be an Arctic sniper rifle expert. Quick, accurate aiming is not my best skill, so I’ve experienced players who are better at me in shooter games kind of looking down at me. Because of the other, non-killing roles of Paladins, I have other ways of contributing to my team. In Paladins, if I select a Support Champion, then I and my teammates know that I am in charge of keeping the team’s health up. And when we win in part because I did my job as a Support Champion, it feels awesome. Another thing that I like about Paladins is that it still gives you something to work for even though you already have available Champions. You see, you can’t maximize a specific Champion unless you’ve gotten that character to at least Level 12 – that’s when all four of the Champion’s Talents become unlocked. Now, you can only choose one Talent that you can use per Champion per game, but this means that you have four different variations of a specific Champion available. Combine this with the card load out system and you’ve just increased the variety of game experiences that you can have. It’s hard to admit but yes, I played Vivian up until I got her to Level 12. Needing to get to Level 12 also pushes me to play each Champion and personally learn about that character’s strengths and weaknesses. I know that there are Tier lists compiled by Paladins fans but like fighting games, a character is only as good as you can be with him/her so currently, I make it a point to look for opportunities to get all of my unlocked Champions to at least Level 12, so that I can have enough time with each to make sure that I really know which Champions I can be good at. To be clear, Paladins is a free to start game. You only have permanent access to five Champions out of a total of thirty eight as of this writing, with four Champions available temporarily every two weeks. Paladins is all about its Champions though, so you do need to buy as many Champions as possible in order to truly enjoy the game. However, that doesn’t mean that you need to spend any real world money on the game, because Paladins will provide you with several different ways to earn resources that you can spend on purchasing more Champions. 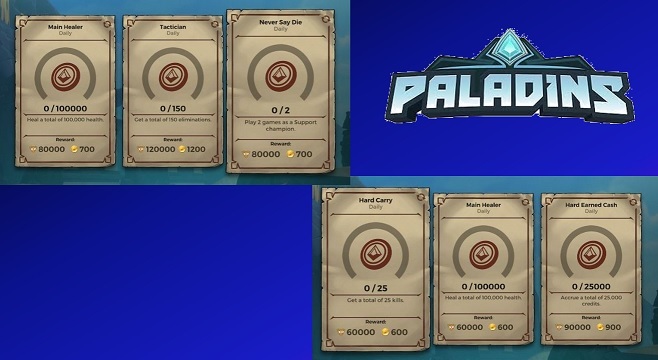 There are two in-game resources in Paladins: Gold, and Crystals. Every day, you can earn either Gold or Crystals just by logging into the game, and in any given seven day period of logging in you can earn a total of 3,000 Gold and 50 Crystals. Just by logging in, you can earn Gold and Crystals – resources that can go to your next Champion. 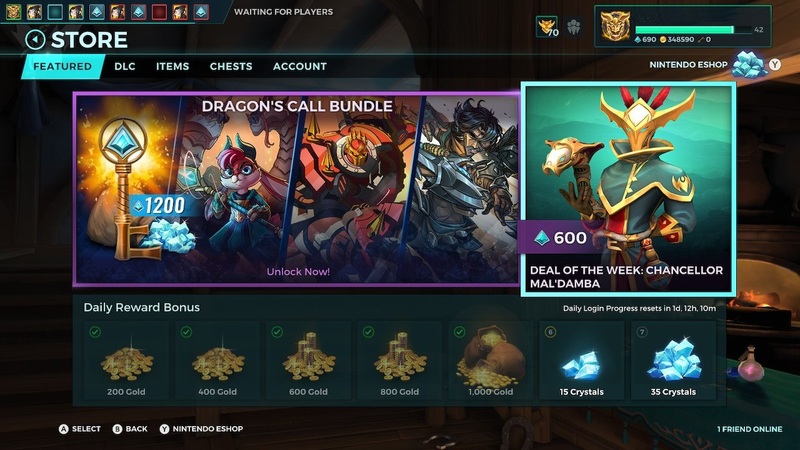 Anyone who is already playing Paladins may call me out and say that this is barely enough to buy Champions, which come in three different price points: 15,000 Gold/100 Crystals, 30,000 Gold/200 Crystals, and 60,000 Gold/300 Crystals. You’d need to log in for 5 weeks to buy the cheapest Champions using your Gold earnings, or 2 weeks if you want to go Crystal. But the Daily Rewards aren’t the only means of earning Gold in Paladins – you can earn Gold just buy playing matches (I earn between 150 to 300 Gold after each match). During the current Battle Pass Season, you can earn a total of 85,000 Gold just by playing and reaching Level 73 of Tier 8. And there are Daily Quests too (a total of three per day) which can earn you anywhere between 600 and 1,200 Gold once you complete the quest requirements. Depending on the difficulty of the Quest, you can earn as low as 600 or as high as 1,200 Gold. I like being organized so right now, what I’m doing is buying a new Champion per Class and I’m playing as these Champions up until I get them to Level 12 (or higher). Once I’ve run out of Champions to train, I buy new Champions. So I’ve been slowly working my way through the Champions, and having these clear goals has kept me playing Paladins match after Paladins match. I haven’t even gotten into playing Ranked, yet! Of course, I wouldn’t be writing about Paladins if it didn’t come out on the Switch and I’m glad that it did. I guess this talks more about the Nintendo Switch than Paladins, but being available on the Switch just makes Paladins more available to me. And it’s not because I only have a Nintendo Switch and not a PS4 or Xbox One, it’s because on the Switch I can play Paladins almost anywhere – and that’s big for a guy like me who works full time. More often than not, I don’t have enough free time at home to complete all of the Daily Quests in Paladins, especially for the harder Quests like reaching a certain number of wins. 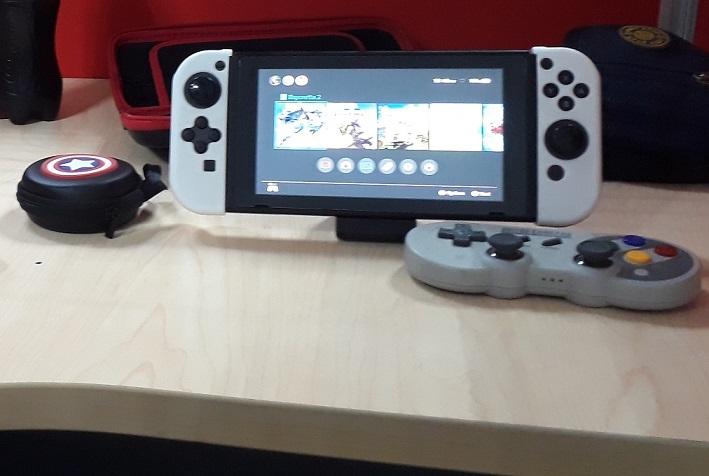 This is where being on the Nintendo Switch comes into play – because of it’s portability, I can play Paladins at the office during my breaks and work on completing any Quests that I missed. Although I do have to admit, I have to be careful about playing too much and not being able to get work done! Being able to play Paladins at my desk is a huge bonus! Right now, most of my video game time has been going to Paladins and it’s not a mystery why. I’m glad that a free to play game like Paladins made it’s way to the Nintendo Switch – I’m having a lot of fun with it and I don’t see myself getting tired of it any time soon. Great write-up! This makes me want to play Paladins—I’ve never tried it! Thanks! After re-reading, I don’t think I’ve done the game enough justice. Have you had the chance to try Paladins now? What did you think about it? Not yet! I’ve been preoccupied with some other games, but I definitely want to try it out soon.